bottling (GB) Your browser does not support any audio element. mise en bouteille, enbouteillage (F) Your browser does not support any audio element. imbottigliamento (I) Your browser does not support any audio element. For used bottles Thorough cleaning, disinfection and sterilization is essential against harmful microorganisms as Acetobacter (Acetic acid bacteria), yeasts or molds, For sterilization is ozone. peroxyacetic. sulfur dioxide or hydrogen peroxide used. The filling date must be chosen so that the wine in the bottle reaches its peak. For fruity white wines, this is already one to three months after fermentation. At in Barrique This can be many years to decades developed top reds. 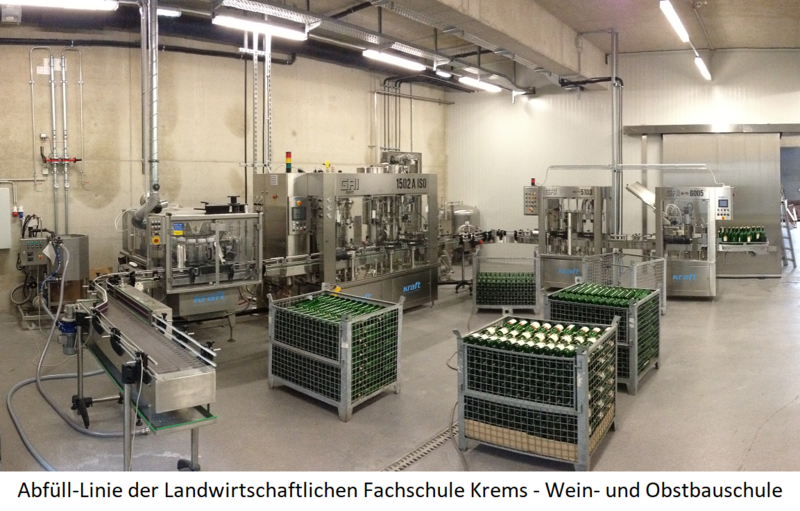 An important influence on the type of bottling has the shutter in terms of the diversity of Leeraumgröße in the bottleneck and the oxygen supply. There is no 100% tight closure. The ratio of permeability of screw cap and cork (Natural cork) is 1 to 3 or 4. There are already alternative closures with controlled oxygen supply such. B. Nomacorc and VinPerfect, This is called nanooxigenation (see below micro-oxygenation ). The amount of oxygen uptake by the closure is related to the question of whether and how much oxygen for the bottle aging is required. Especially with red wines, a constant supply with regard flavorings and colour be positive. In addition, however, the possible amount of air in the bottleneck must be calculated, which is filled with inert gas or omitted during vacuumization. Will a wine with air in the bottleneck with 100 mg / l sulphurous acid this means 40 to 50 mg / l of free sulphurous acid. With 15 or 20 milliliters of air, the free sulphurous acid reduces to about 20 mg / l within the first three months after bottling, ie by about half. This means a faster maturation and thus shorter durability of the wine. Also by the filling process, the oxygen uptake can be influenced. In short tube filling machines, the wine drips down the inner wall and absorbs more oxygen. For a long pipe, however, the bottle is filled from bottom to top and absorbs less oxygen. Depending on filling technique and Lock (Cork, screw cap, glass cork, etc.) results as already mentioned, the volume between the liquid and the closure, as well as whether or how much oxygen in this whitespace is included. For hot filling, depending on the alcohol content, the thermal expansion of 0.75 liters of wine is 10 to 13 milliliters; on cooling, there is a corresponding reduction in volume. Upon cooling, a vacuum forms, the void is filled with carbon dioxide from the wine. In a cold filling is an air displacement means inert gas advisable, since the approximately 15 milliliters of air still contain 4.2 milligrams of oxygen. Furthermore, the displacement of the air by dry ice or closing under vacuum is also used. Leaky closures lead to the enrichment of the void with oxygen and by evaporation of wine to less filling level, which is through oxidative Processes in any case adversely affects. Regarding the decisions for the optimal closure and the treatment of the white space, the storability of the wines should be considered. Most wines today are drunk within the first one to two years - in Germany and Austria, these are well over 90%. It is therefore of much greater importance whether the void was rendered inert or vacuumized than controlling the influence of oxygen on the vial. Because the effect of the different oxygen passage of the different types of closure, would make itself felt only after a storage period, the majority of the wines did not reach. This page was last modified at 6 October 2018 at 16:28.